Jody Clark (born 1 March 1981) is an English engraver employed by the Royal Mint. 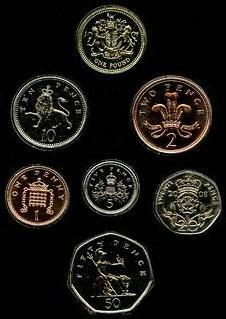 He designed the fifth and latest portrait of Queen Elizabeth II to feature on coins of the pound sterling. Clark started his engraving career at the Arden Group with fellow experts Julian Homer and Christopher Nield. Since he joined the Royal Mint in September 2012, Clark has worked on a number of projects including commemorative pieces which were given to attendees of the 2014 NATO Summit in Wales and medals struck to commemorate the 2014 Ryder Cup which took place at Gleneagles Hotel, Scotland. He has also worked on commissions for Azerbaijan, Costa Rica, Lesotho and Tanzania. In 2014 a design by Clark was featured on the Britannia coin. Prior to joining the Mint, Clark worked in commercial packaging design. 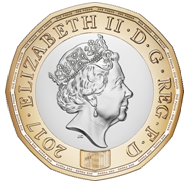 In 2015 it was announced that Clark's anonymous submission to a design competition had been chosen to become the fifth definitive coin portrait of Elizabeth II to feature on British coins. Clark is the first employee of the Royal Mint in over one hundred years to have designed such a portrait of the monarch. 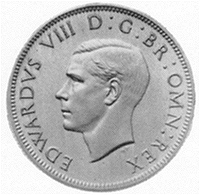 At the age of 33 when his design was chosen, Clark was younger than any of the other four designers to have created portraits of Elizabeth II for British coinage at the time their design was chosen. Uniquely, Clark's portrait of the Queen was created using computer-aided design software to turn his initial sketches into the required low-relief model, with no manual sculpting being used. Production of coins bearing Clark's design began on 2 March 2015, and they appeared in circulation later in 2015. Clark is originally from the Lake District in Cumbria. In early 2015 he went on paternity leave following the birth of his first child. 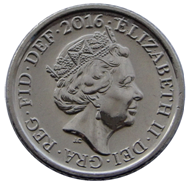 ^ a b c d "Latest Queen Elizabeth coin unveiled". The Guardian. Retrieved 4 March 2015. ^ "Interview with Jody Clark, Designer of the New Queen Elizabeth II Effigy". Coin Update. Retrieved 4 March 2015. ^ "Behind the design: Britannia 2014". Royal Mint. Retrieved 4 March 2015. ^ a b "Royal Mint unveils new coinage portrait of the Queen". BBC News. Retrieved 4 March 2015. ^ "Queen's new portrait for coins revealed by Royal Mint". The Telegraph. Retrieved 4 March 2015. ^ "The fifth portrait of The Queen is unveiled". Royal Mint. Retrieved 4 March 2015. ^ "The Queen's New Portrait For UK Coins Revealed". The Huffington Post. Retrieved 4 March 2015. Britannia has been used in several different senses. The name is a Latinisation of the native Brittonic word for the island, Pretanī, which also produced the Greek form Prettanike or Brettaniai, which originally, in the fourth to the first centuries BC, designated a collection of islands with individual names, including Albion or Britain. In Modern Welsh the name remains Prydain. By the 1st century BC, Britannia came to be used for Great Britain specifically. After the Roman conquest in 43 AD, Britannia meant Roman Britain, a province covering the island south of Caledonia. When Roman Britain was divided into four provinces in 197 AD, two were called Britannia Superior and Britannia Inferior. 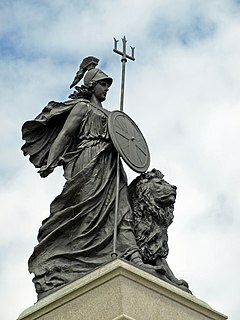 Britannia is the name given to the female personification of the island, and it is a term still used to refer to the whole island.